Boat electronics installation Tampa, Pinellas, Clearwater, St. Petersburg, Boat Wiring. For over 20 years Bluewater Boat Works has been installing electronics on boats throughout the Tampa Bay area including Clearwater, St. Petersburg, Tampa, and Pasco Counties. Bluewater Boat works will professionally install, rewire, or update your boat's electrical systems. Wiring a boat is very important as it is the most common components to fail. If not wired properly corrosion will take over causing your boat's electrical system to fail repeatedly. Bluewater Boat Works will make sure your wiring is high and dry and clear of any contact with water. All work is professional organized with marine grade products. This is a sample of the a properly wired boat done by Bluewater Boat Works. All electrical connections are marine grade heat shrink and bundled in a clean fashion. Everything is neatly put together and easy to access. Bluewater Boat Works has many years experience involved with the installation of radar's, depth finders, bottom machines, gps, lorans, navigation lights, deck lights, trim tabs, jack plates, batteries, and other components. 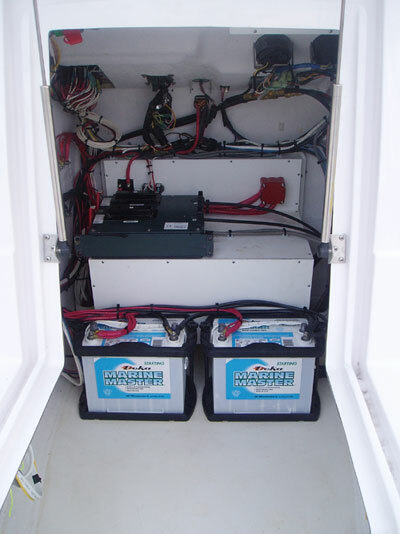 To schedule an appointment to have electrical work done on your boat please call Bluewater Boat Repair @ 727-992-2781 .